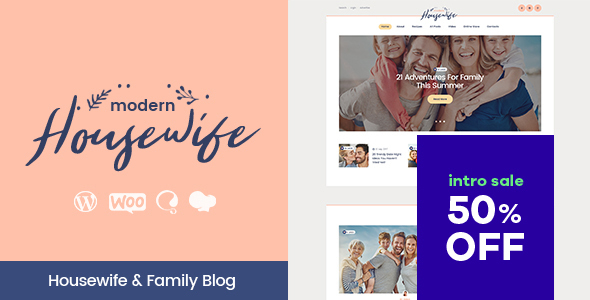 If you want to share how to be a housewife or to tell a story of a family life, then our theme Modern Housewife will be a splendid platform for your website. We believe, that the overall stylistics and the functionality of the theme will also be useful for you if you wish to build a pregnancy, childbirth or parenting blog. If you wish to go viral with your blog, you should definitely consider Modern Housewife with its warm pastel color scheme, two different Homepages, a variety of blog layouts, Instagram Feed support, Recipes and many other awesome features. This WP template is compatible with amazing plugins. WPBakery Page Builder allows to edit the contents without programming skills. With Slider Revolution, Instagram Feed and Essential Grid the visual look will be definitely outstanding. Using Mailchimp you can get your email list and perform newletters for your readers. Above all ThemeREX Addons plugins will ensure your experience is absolutely smooth.